“When you start wiping out history, sanitizing history to make you feel better, it’s a bad thing,” said Condoleezza Rice. The Secret Relationship between Blacks and Jews, a book by the Historical Research Department, the Nation of Islam, March 1994. The Secret Relationship Between Alabama’s Blacks and Jews, a book contains Jewish sources). Who Brought the Slaves to America? By Walter White Jr., 1968. The Shocking Jewish Role in Slavery Part II: The Media Coverup, video by David Duke. Jews Selling Blacks, A genocidal legacy of human trafficking uncovered, a book by the Nation of Islam Historical Research Group, First Edition, Second Printing 2010. A Jewish Defector Warns America: Benjamin Freedman Speaks on Zionism, transcript of Ben Freedman’s 1961 speech at the Willard Hotel. Jewish Marrannos Who were Fake Christians brought Black Slaves To America, this documentary comes from the book “Who Brought The Slaves To America” is short and to the point. In a reaction to the unfortunate violence in Charlottesville, Virginia, USA, on August 11–12, 2017, I wrote an article titled “Charlottesville Virginia Violence is not a Race Issue” expressing my opinion that violence in Virginia was NOT racially motivated by White Nationalists against any group, it is only a political confrontation, but unfortunately some African Americans got it totally wrong. That violence was a deliberate attack by globalists organized by Jews using their sponsored groups against patriotic White nationalists. The aim of that violence was to create racial divisions and hatred in the USA to serve the globalist agenda of establishing control over the USA and the world. It advised to consider this as an opportunity to unite USA. It said, If African American and Hispanic are smart enough they must support White nationalists because if they don’t and let the Whites loose then definitely they will be the next victims of Globalism. 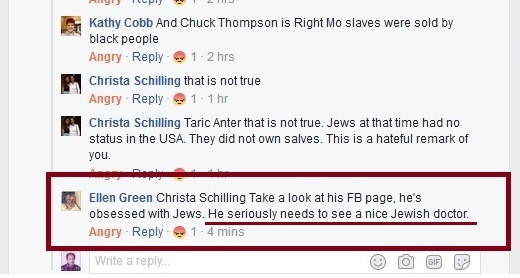 Important Note: The Jew Ellen Green says [He seriously needs to see a nice Jewish doctor.]. Notice she said Jewish doctor not any doctor! This means she know that Jewish doctors have special type of medicine for Goyim other than the normal medical practice. Can anybody explains what a “nice” Jewish doctor means? 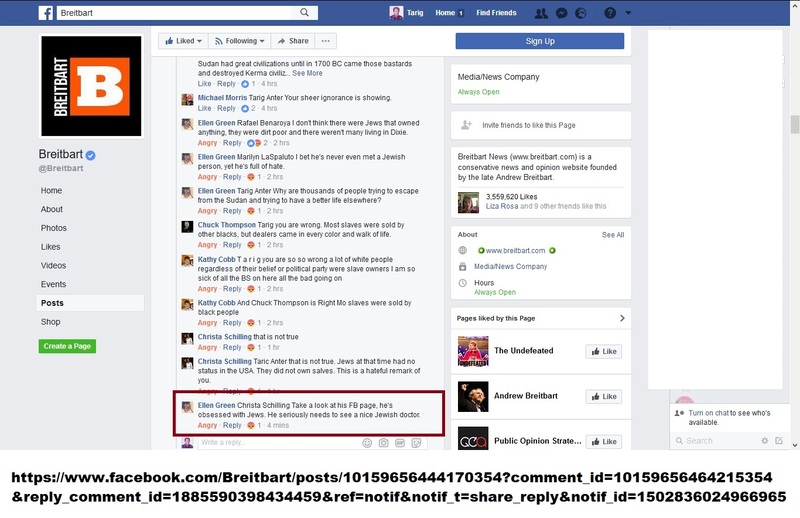 See the whole thread here: on Breitbart Facebook page. As you cite works above by Farrakhan, he advocates violence against whites including against white police officers. Most Blacks and Hispanic are fooled by Jewish media and deception and blame Whites. But I am sure they don’t know the real history and present. That is why many researches and work must be done to clear the misunderstandings.